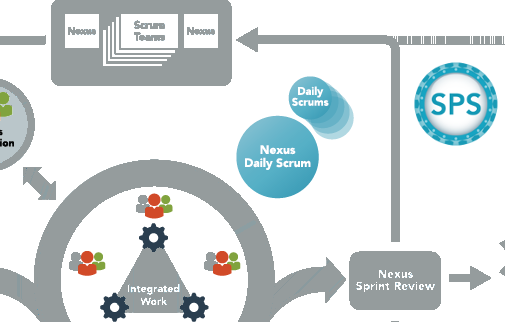 The Nexus Daily Scrum is the scaled version of the Daily Scrum event from the Scrum framework. Attendees at this event inspect the current state of the integrated Increment and seek to identify newly discovered integration issues or cross team dependencies. Where issues are identified, individual Scrum Teams will then take ownership to address the underlying problems. 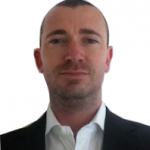 As with the Daily Scrum, it is expected that attendees at the Nexus Daily Scrum will self organise to find the best ways to make effective use of this event. The Nexus Sprint Backlog should be used to visualize and manage integration issues and dependencies that have been identified. The Nexus Daily Scrum is attended by representatives of each Development Team that comprise the Nexus. The Development Teams will self organise to decide who is the right person or people to attend this event. As with all things in Scrum, inspection and adaption may lead to the attendees to this event changing over time. A Scrum Master may facilitate this event and help the team to self organise as requested or required. A Product Owner may also attend if there presence is helpful to the team. Often the discussions in this event will not prove interesting to a Product Owner as they will involve high levels of technical detail. The Nexus framework does not mandate a time box for the Nexus Daily Scrum. This is deliberate as depending on the number of teams in the Nexus, number attendees at the Nexus Daily Scrum and level of integration and dependency issues being handled, the time required may vary between organisations. The Nexus framework does suggest that the duration of Nexus events be guided by the length of the corresponding events in the Scrum framework. So for the Nexus Daily Scrum the target for the time box would be 15 minutes. However, Inspection and adaption may lead to this being adjusted over time as required. As with the Daily Scrum, the Nexus Daily Scrum should be a forum to raise issues, rather than go into the detail around solving them. As such it should be kept short and issues should be taken away for further discussion and back to the Development Teams to resolve. As with the Daily Scrum, the Nexus Daily Scrum should be held at a consistent time and place to ensure attendees have a clear expectation of when and where they need to be. Just because the Nexus Daily Scrum mandates a meeting between members of the various development teams, they can and should meet at other times as appropriate to deal with integration issues that emerge during development. Impediments shouldn’t be queued for discussion at this event. The Nexus Daily Scrum is the latest time any shared issues should be raised. The Nexus Daily Scrum replaces the earlier concept of a Scrum of Scrums that was widely used to discuss issues and dependencies when multiple Scrum teams worked on a single product. The Nexus Integration team also takes on many of the responsibilities that would previously have been taken on by representatives at the Scrum of Scrums.